Congratulations on your sale Eloise! Featured in the group How Bold Thou Art! Featured in Five Star Artist! Featured in the Spanish Theme Artwork Group! Delightful painting, Eloise! Congratulations, your beautiful painting has been Featured on "Fuzzy Warm and Soft"! Featured in the Pet Photography and Art group! Featured in the group All Aspects of Abstract Work! Eloise, love your work! This roo is fancy and he knows it! 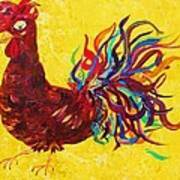 Feature on Poetic Poultry! Thank you Chuck for the feature in AAA Images! Thank you, Marie. The Emmaus Walk is wonderful. Thank you for the lovely comment and certainly for the feature in the group Christian Art and Photography. Thank you Joe for the feature in the group WINGS! It's always such a pleasure. Thank you for the feature in the group PAINTINGS. Thank you Krista for the feature in the group Originals that SOLD! 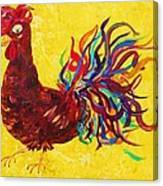 Eloise, I do love me some chickens... this is really great, happy colorful image! All your stuff is so fun and happy! Nice....favorited! 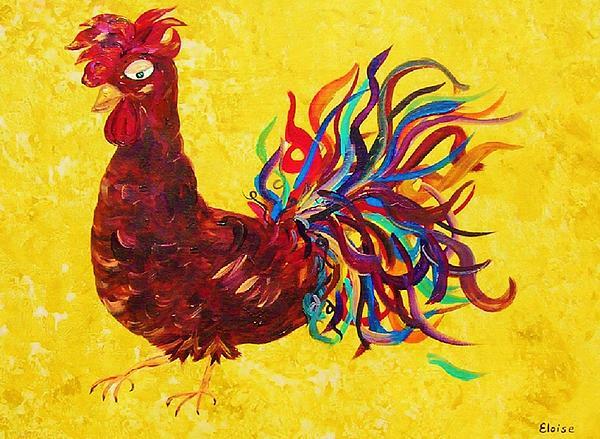 Decolores;"De Colores" (Of Colors) and a rooster gives us a "Rooster of Many Colors." Sometimes, when I look at this rooster, I am reminded of the spiritual truths sometimes associated with a rooster by various organizations. 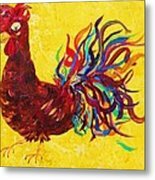 With its bright colors, this print would be beautiful in any room of the house: living room, den, kitchen, bedroom, family room, bathroom. Or hang it at your lake house, lodge, cottage, or beach house. Would also be a lovely gift for a pastor or friend with whom you shared a special spiritual experience or other spiritual journey. Or perhaps you would want a remembrance for yourself ... it could occupy a special place at your church: the pastor's study, Sunday school room, choir room, or foyer.